On Sale Now! 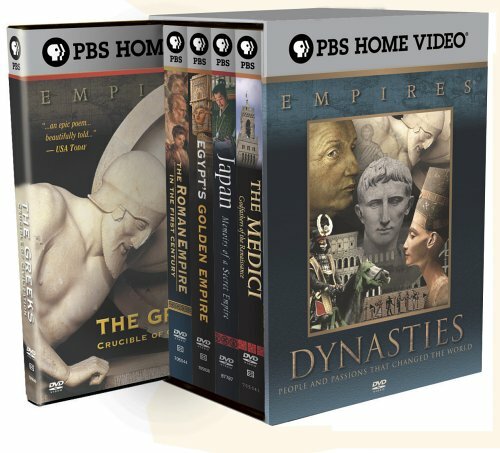 Save 3% on the Empires Collection - The Dynasties (Egypt's Golden Empire / The Medici: Godfathers of the Renaissance / Japan: Memoirs of a Secret Empire / The Roman Empire in the First Century / The Greeks: Crucible of Civilization) by Paramount Home Entertainment at Epic Movie. MPN: unknown. Hurry! Limited time offer. Offer valid only while supplies last. Within the history of civilization are great eras of struggle, triumph, and loss. These periods are reflective of the best and worst of humanity. Within the history of civilization are great eras of struggle, triumph, and loss. These periods are reflective of the best and worst of humanity. Empires is a ground breaking series of historical films which present the people and passions that have changed the world. Empires Collection: The Dynasties is a compilation of five outstanding stories of some of histories greatest dynasties. If you have any questions about this product by Paramount Home Entertainment, contact us by completing and submitting the form below. If you are looking for a specif part number, please include it with your message. VEGGIETALES - DOUBLE FEATURE - GOD MADE YOU SPECIAL AND WHERE'S GOD WHEN I'M SCARED?